Our Curfinal Capsules reduce hyperlipidemia in the blood, improve blood circulation, strengthen cardiac muscle, increase HDL and decrease total cholesterol. 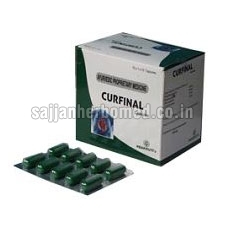 We are a reputed Supplier of Curfinal Capsules from Punjab, India. The Curfinal Capsules we make available have accurate composition and do not result in any side effects. It is recommended to take 1 Curfinal Capsule or as directed by the physician. Buyers can obtain the Capsules at competitive rates. High cholesterol levels are due to a variety of factors including heredity, diet, and lifestyle. Less commonly, underlying illnesses affecting the liver, thyroid, or kidney may affect blood cholesterol levels. Too much cholesterol in the bloodstream, the excess may be deposited in arteries, including the coronary arteries of the heart, the carotid arteries to the brain, and the arteries that supply blood to the legs. Cholesterol deposits are a component of the plaques that cause narrowing and blockage of the arteries, producing signs and symptoms originating from the particular part of the body that has decreased blood supply.